Peanut butter healthy cereal bars are great for on the go. Plus you’ll learn how peanut butter and honey create perfect chewy texture. Quick and healthy Peanut Butter Cereal Bars made with cereal, oats, peanut butter, honey, chia and flax seeds. Breakfast is an important meal around here, as you can tell from my recent brunch themed posts. My easy go to breakfast is often smoothies, however you can’t forget classic and a family favorite, cereal as well. Sometimes I even add cereal or granola to smoothies, but will save that for another recipe. For this Peanut Butter Cereal Bars I’m mixing cereal and oats into delicious, healthy, filling, nutrient rich, vegan and gluten-free cereal bars. I wanted to include more adjectives but I think you get the point. 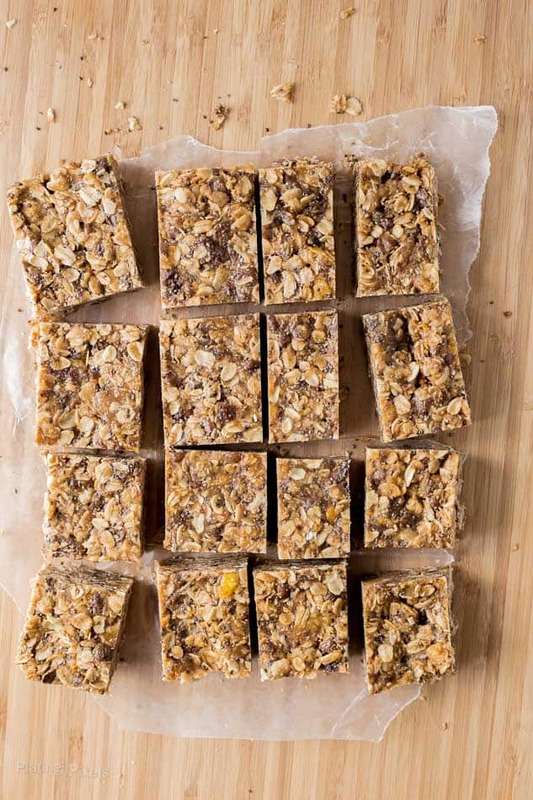 These cereal bars are easy to make in big batches and a wonderful option for having breakfast ready, saving you valuable time in the morning. Enjoy them with your morning tea of coffee, or take them with you to work as a healthy snack. If you’re craving a sweet snack, try these instead of vending machine packages for a balance snack that’s not full of empty calories. These cereal bars are simply a mixture of Honey Bunches of Oats Chocolate, old fashioned oats, flax and chia seeds, peanut butter and honey. Mixed together into a dense and chewy breakfast cereal bar that’s vegan and gluten free. Peanut better is full of protein while chia and flax seeds contain fiber and healthy fats. What holds cereal bars together? 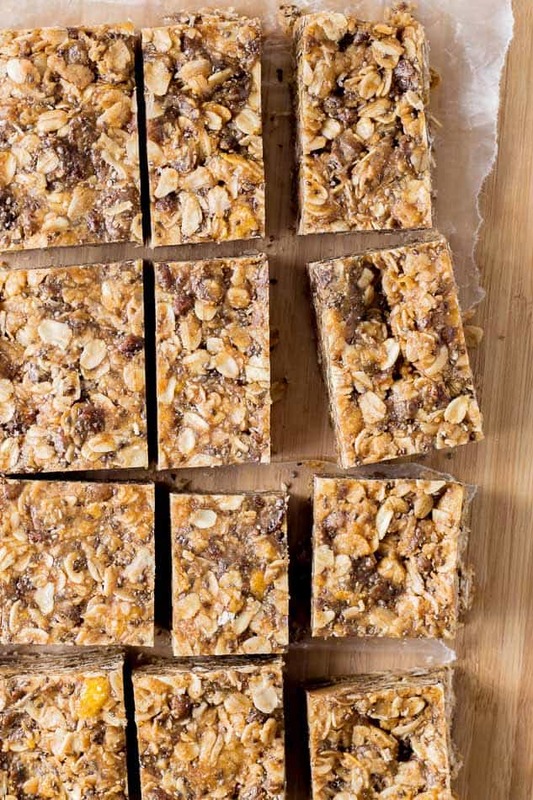 Peanut butter and honey not only add flavor and sweetness to these cereal bars, they’re the key ingredient that holds them together. Otherwise it would just be cereal and dry ingredients. Simply adding these two ingredients changes the entire dynamic of the recipe. Heating first helps combine the flavors and makes it slightly more liquid. When you mix in with the dry ingredients it evenly coats and binds everything together (just enough to moisten without being runny). After you pack down into a dish and let it cool, the mixture will firm up into perfect chewy cereal bars. Peanut butter cereal bars make a protein and nutrient rich breakfast. 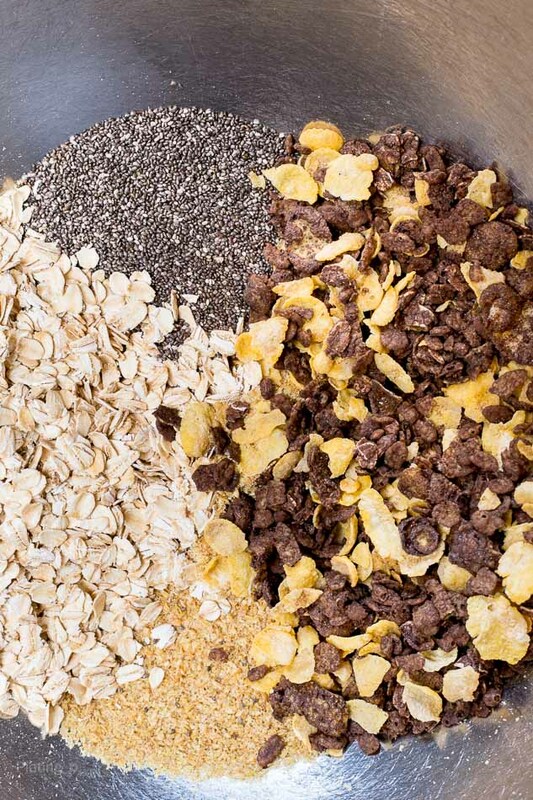 In large bowl, stir together cereal oats, flax and chia seeds; set aside. In small saucepan heat peanut butter and honey over medium heat, stirring often, until melted and smooth. Remove from heat and stir in vanilla. Pour over cereal mixture and stir to combine well. Transfer to a parchment lined 10x15 baking dish. Evenly press mixture to form a dense even layer, about 1-inch thick. Sprinkle with a bit of sea salt (optional). Allow to cool and set. Cut into squares. Store in airtight container at room temp for a few days. In fridge it will last up to a few weeks. I don’t like to use chocolate can we make without and do we need to use extra oats ? Hi Robbie. I’d keep the ratio of wet to dry ingredients the same. You could sub with a different cereal or more oats. Thanks guys,,I have idea for breakfast! Just a note in case it hasn’t been mentioned – honey actually makes this non-vegan. Agave nectar would be a vegan substitute. Nonetheless, I’m looking forward to trying it! Hi Ashley, thanks for the comment. I had agave as an option in the ingredient list just for that reason. Hey Matthew, these bars look super tasty while being healthy(ish). I will make a batch soon! Yummmm! This sounds like a delicious on-the-go breakfast idea! It totally is Taylor! Thanks! These look so good!! and healthy too? Win Win!! Wow – I don’t think we could go wrong with Honey Bunches of Oats and peanut butter! I love both! Well that works out perfectly then! Thanks Clare! This looks like the perfect snack to have on hand! Looks amazing! I’ll have to try these! Yum! What a great idea. We love granola bars and this sounds so much better and pretty easy too! It’s super easy plus you get to pick what goes in them! Thanks Carlee! Thanks and hope you do Aishwarya! These bars sounds great! Now I am so excited to try them, I have some Chia seeds I need to use up, so yay! Thanks! You can put pretty much any seeds or nuts in these, but it’s a wonderful way to get extra chia seeds in your day. Thanks Leah!